I've been making exterior doors for 30+ years, since 1995 using Spanish Cedar (stable, decay resistant) and I'm positively flummoxed! I made a pair of large doors for a customer in March of 2016, 40 x 100 with 2 raised panels in each. Bottom panel is 28 x 29", top panel is 28 x 46" - 1 3/8" thick. Get called out last winter because the contractor damaged 2 panels and badly repaired them, so the customer wants them replaced. When I go to the site, I notice 3 out of 4 panels have cupped across the width, all towards the interior, about 1/4". Since we're making 2 new panels I take care of the third at no charge. Send them off to the finisher - dark stain, 3 coats Mccloskey's marine spar including the edges. Go to site, caulk the panels in with elastomeric sealant (Lexel) 3 months ago. Get a call from the customer about problems, go back to the to site - the 4th panel has cupped 1/4" since April, the 3 new panels are cupped about 1/8" - all the same direction - towards the interior! Doors are fine. The process - first these are from two totally different loads of wood, probably from different countries. Next these are made of 3" wide boards with the growth rings flipped from piece to piece. Glue is Titebond 3, two weeks drying time before machining. Panels were dead flat before and after finishing. 1/4" clearance with waterproof foam spacers to allow for expansion. This is the way I've been doing panels for decades, and I've done a couple hundred of doors since these were first built. I've never seen anything like this. We don't get much sun in Pittsburgh, but a lot of rain. There is no evidence that these doors are getting hit with either - under a 6' overhand, finish looks brand new. What the Sam Hill is going on here???? You might start with environmental factors, such as a change or a marked differential in the interior space humidity level. Has a fish tank, hot tub, indoor pond or pool, sauna, humidifier, etc., either existed or been added to the space? Any recent wet work (tile, plaster, etc.) done in the interior space? I would verify this before assuming any other factors, especially if you have not had issues with your construction methods in the past. I may be reading this wrong but when I read cupped towards the interior I think of the cupped face being towards the interior (bowed face toward exterior). That would to me indicate the opposite of Tony's condition (a wet interior). Is the home running excessively dry AC in the summer? Something up with the HVAC pulling miles of water out of the air? HVAC register blowing directly on the door? Put a hydrometer in the space for a few days? The panels are bowing towards the interior, in other words the exterior face is concave. This is the main entry, so no radical humidity inside, most certainly less than what we have outside. I can't understand how the entire panel made of 9 or 10 pieces - with the growth rings alternating can move like this. Not once, but now a second time (from different lumber, sealed all the way around w/3 coats of marine spar before being set in the door)!! Some years back I made an approx. 2' x 3' x 1 1/2" thick hanging sign out of pine. It hung from a horizontal overhead east/west beam making one side of the sign face the southern sun. In a matter of a few months that sign cupped concave to the south. I turned it around and a few months later it was once again flat. Then a few months further along it was once more cupped concave to the south.....the opposite bend in the wood to what it had been before being reversed. Like you I had built the blank from relatively narrow strips of pine in order to minimize overall cupping. Given the results there was no question that the south facing side of the sign was being dried out by the sun subsequently causing that side to shrink. My first thought on your doors was that the same is thing is happening there. Your mention of not much sun on the doors though gave me pause. Pittsburgh on the other hand is not an issue one way or another as my sign was in Connecticut which is a bit further north than Pittsburgh. I still think though that the problem has to be either the wood drying out and shrinking on the outside face, or swelling due to a higher level of humidity inside the foyer/entry. Are you certain the doors aren't getting some early day or later afternoon sun? Are there any large plants in the entry space that may be getting watered on a regular basis? Given the consistent nature of the failure I'm hard pressed to believe it's not due to some sort of unbalanced air environment on one side of the doors or the other. You might consider putting an inexpensive hygrometer to measure humidity levels inside the entry/foyer and on the wall outside the doors. You could ask the homeowners to monitor these and keep a daily record of weather conditions, times of day checked and readings. Are your 1-3/8" panels one piece, meaning full thickness? If so, I think that's the source of the problem. A wide, full thickness panel with even a fairly small difference in RH from inside to outside and it's going to bow, and as the RH difference increases so will the amount it bows. Finish doesn't stop moisture vapor, only liquid water. I think the solution is to use two panels, 5/8" thick, back to back, with a thin separator like closed cell foam or aluminum foil between them. As others have said, put a RH meter inside and out and check the readings for a few days. Is there a storm door, too? A 6' porch won't prevent sunshine from hitting the bottom portion of the door if it faces South. 28" wide panel is 90% of the problem. Panel movement goes up exponentially with increasing width. 28" is magnifying the effect big time. I agree with BH. There is a specific cause for the cupping. Regardless if its multiple strips of Spanish cedar or vertical grain cedar it will still move in a direction based on moisture content. Sorry Adam, I can't let your comment on exponential wood movement go unchallenged. Using the woodweb shrinkage calculator I came up with 5/16" of expansion for the panels if they gained 6 percent moisture. Wood movement is a linear relationship to overall panel width. As to why the panels are cupping I would concur with BH. Finish just slows down the moisture so the effects happen more gradually. Unfortunately I cannot think of a good solution to this problem. I took Adam's comments to be referring to the likely amount of cupping of the wood with a greater board width. I think you saw it as referring to the amount of expansion/contraction across the width of the board. Correct? Yes, I can see that. I have been making Western Red Cedar doors for yurts for five years now. The panels are 26" wide made up of a mixture of flat and quartered grain. These doors are only oiled and are not necessarily guarded from rain and sun. I have had one or two that have had cracks in the panel which I think I caused in manufacturing (I didn't support the panel when mortising lockset location on the cnc with vacuum). The differences in my door to the OPs is my panels are 5/8" thick and the finish. I had discounted the idea of two back to back thinner panels thinking it was a needless complication but theoretically the thinner panel will come to moisture equilibrium throughout more quickly. The fact that you have made doors just like this before, many times, without problems rules out your process and methods. Rule out all that. Rule out the finish, since it works on your other work. Rule out location since it is not unique? The panel clearance is adequate. I have metered doors in place for years and have never found one that is more than 4% different from when made. Most are less than 2%. And, yes, they read differently from interior to exterior. The cupping means that the panels are losing and/or gaining moisture on one side much more than the other. What has happened to the wood panels you removed? Have they flattened out on their own once they have the same RH on both sides? What is the MC of the panels, both sides, as they came out of the door? What is it now? Get a hygrometer and put in the house for a day. You apparently place your panels and add stops to the [assumed] interior side of the door to hold the panels. Did the cupping of the panels distort or move the panel stops? (glued or nailed or ?) Or did things remain flat at the two ends, while the middle cupped? The fact that they all cupped the same, despite ring flipping and 3" strips (Metz's rules?) rules out that whole thing as an effective strategy. I challenged him on that in my rebellious youth since there was evidence everywhere to the countrary. He just worked in places that used poor quality materials and methods. My opinion, 100%. More questions than answers for the moment. But, the key to understanding is in the panels you removed. I also would go thru the remaining lumber and meter it to see if it is consistent from board to board. I'm betting lunch that you got a hold of some wet wood, twice. Lumber- 6/4 or 8/4? Have you done a case hardening test on it? That can cause your problem while the moisture looks reasonable. I suggest working thru the boards, clipping 1" off an end of each and sawing it to see how it responds. I hope that shows problems and your problem is solved. David's post is very insightful on one key point. Perhaps you got some high moisture content wood. If that is the case it wouldn't matter that you flipped small strips or which face was out. If the wood was too wet then either the inside or outside face is going to dry more quickly depending upon outdoor humidity levels and the indoor conditions.....i.e. heat and/or air conditioning. Have you checked the moisture content of the lumber from which those panels were made? The panel calculator is looking at movement simply across the width. We use it for things like groove depth in doors. In reality the panel is not only expanding in width, but also in thickness. That is why narrow boards look so cupped when wet on one side. Yes, the amount they grow in width is linear. The amount they cup is not linear. It is way more complex. Especially due to growth rings. Rip and flip will help, but then you end up with sine wave panels & tables. I forgot to ask about the fit/margin of the doors? A great discussion and some valid points. I would agree that David Sochar's point about checking the lumber, and that is probably a good thing to do on all thicker lumber. I would also respectfully disagree on that being the cause, given the evidence of the panels being made from two different sources of lumber and having the same reaction at the jobsite. It sounds as though the panels are both removable and reversible, and if this is in fact the case, perhaps the panels could be reversed in the door, and see what the reaction is. It would be interesting if this corrected the problem, either temporarily or permanently. While David may well be right, I maintain that the problem has more to do with site conditions that have yet to be discovered and taken into account. Of course, the worst of this is that someone other than the millworker is now aware of this problem, and as such any corrections will become a point of hyperfocus with respect to the flatness of the panels, which may not have been an issue in the first place. I also can't help but wonder if putting some extra finish on the exterior of the panel might not be helpful, since the imbalance may cup the panels in the other direction. Just trying to offer practical solutions. I thank you all for your input. I did check the lumber (both loads) when they came in. I buy greater than 1000 bd/ft at a time, and many other doors and panels came from the same wood batches with no problems. So obviously this is a site specific problem, and I'll be returning to the site with instruments in hand. I'm going to reverse the panels, I would bet lunch they're going to move the other direction. We'll see. I have made panels this wide and wider before without problems. I considered offering the owner to turn them into 4 panel doors, but I have a gut feeling I'll end up with 4 cupped panels per door instead of two. I agree that experience has shown that Metz's rules don't guard against everything, but I figure they can't hurt so I still follow them. Man, they do call this wood WORKING not wood PLAYING!! Adam, I see your point and misread your original post. With respect to the site conditions, the description of dark stain raises a flag for me. I was called in to attempt to repair a pair of entry doors installed improperly. I corrected the install but the home owner was in a battle with the door manufacturer because the panels had cracked and shrunk revealing unstained edges. The warranty was void according to the manufacturer because of the stain colour and southern exposure. These doors had a porch overhang. I am sure in the many doors you have installed this is not the first to be south facing and dark stained but it might be a significant factor. 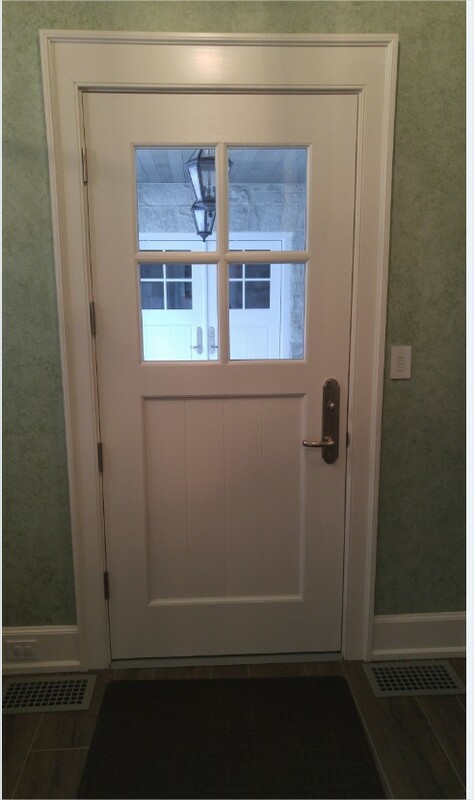 Doors finished both sides with same finish and are you sure the same amount of coats ? And, are you verifying they are drying before another coat ? Why are you caulking the panels in and are you caulking both sides ? A couple of years ago we had 1 door (of many) that cupped badly, both vertically and horizontally. Not just the panels but the entire door cupped inwards. We determined that it was due to the fact there is a HVAC supply on both sides of the door and the warm air blowing on the door caused the issue. I liked this post. Great interactive messaging. Enjoyable read.